World recognition for Baked in Belfast’s artisan marmalades | Food NI - Our Food So Good! Baked in Belfast, the Fermanagh-based specialist in highly original jams, has won a string of awards in the prestigious World Marmalade Awards 2019 in Britain. Based near Enniskillen, Baked in Belfast, an artisan business, is now Northern Ireland’s most successful producer of quirky and handcrafted marmalades. A Food NI member, the small company is run by husband and wife team Suzanne and Keith Livingstone. Mrs Livingstone, commenting on the awards, says: “We are thrilled with our latest successes at the world’s most influential competition for marmalade producers. Baked in Belfast was among over 3,000 entrants from over 40 countries to the awards, held at the historic Dalmain Estate, near Penrith in Cumbria for more than a decade. It is the world’s premier marmalade competition and attracts entries for most parts of Europe, South Africa as well as the US and Japan. This year, there are no fewer than 15 categories. 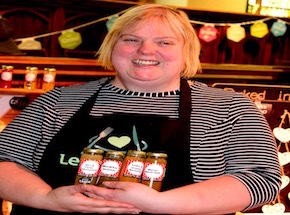 Baked in Belfast was established in 2011 and also specialises in relishes and handcrafted pottery.